December 2016 – What Does The Fox Says? Local television producer MediaCorp (back then known as Singapore Broadcasting Corporation) created a whole drama series known as Kopi-O (咖啡乌), centered around a few low-to-mid income families, you kind of get the idea how local coffee fit into Singapore’s cultural narrative. Kaya Toast, Coffee Shop, and Coffee itself was one of the early research topic and after some more reading, I think I have come to understand a little bit more about our Coffee Shop culture and history. 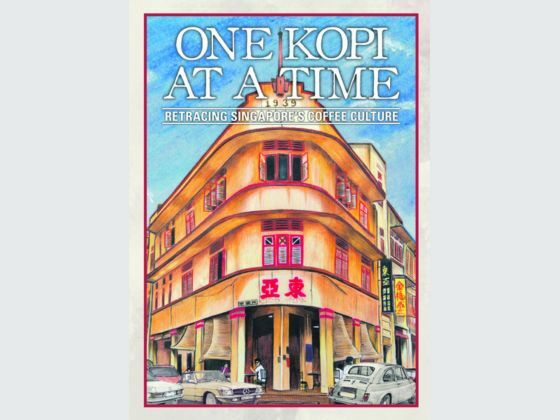 One of the books that I have been reading was ‘One Kopi At A Time: Retracing Singapore’s Coffee Culture’, a book done for SG50 as part of Singapore Memory Project. Although seemingly written for secondary school students and can be finished cover to cover in about an hour, it still provide useful information regarding Singapore’s coffee culture that is deeply ingrain in the nation’s history. I will mainly be using this book as my reference for this post. A Traditional Coffee Powder Grinder. National Heritage Board – Heritage TV. 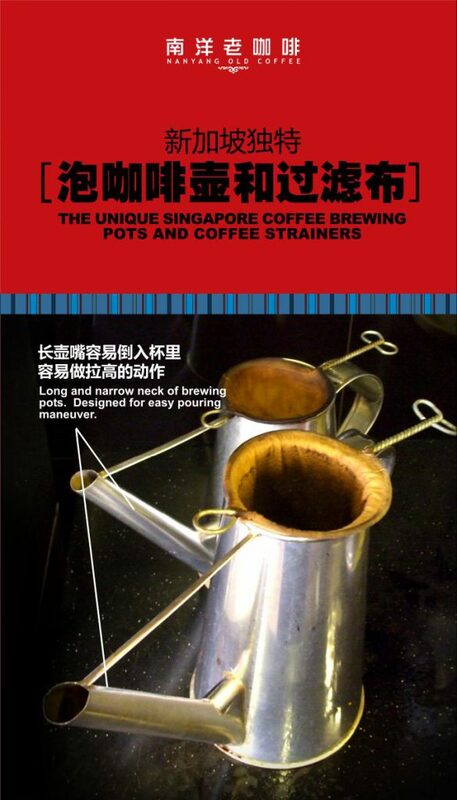 The first thing in the book was that Singapore coffee is known as Nanyang Roast and is full-flavoured, and is “thicker and more fragrant than western coffee”. It is roasted with “corn, sugar and margarine”. Nowadays, it is thought that less than 5 shops in Singapore still make coffee the traditional way by roasting and grounding them. One such shop is the subject of the documentary above is Lam Yeo Coffee Powder (https://www.facebook.com/lamyeocoffeepowder/) located at 328 Balestier Road. 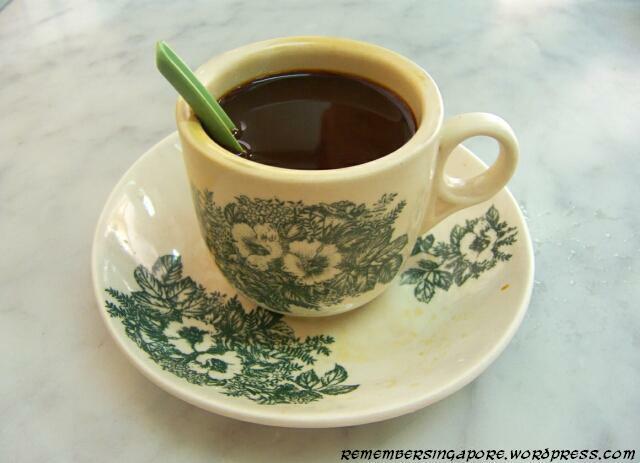 Nanyang Old Coffee is a kopitiam franchise not unlike Killiney Kopitiam and Ya Kun, and it was started in 2009. It has since grown to 9 outlets with 1 in China. Their main outlet is located at 268 South Bridge Road Singapore 058817 (End of Smith Street, Chinatown). They claim to sell “authentic Singapore coffee” and have even attracted the news crew of China’s CCTV4 (start at 23:50). The documentary states that due to Singapore’s geographical location with no winter, storage of coffee beans was a headache for the early coffee seller. They eventually created a special technique that created a unique taste for Singapore’s Nanyang Coffee. The Kopi Socks seems to be native to Singapore as the “new immigrants did not have access to traditional brewing appliances, a new sock filter was introduced”. According to the book, “Mr Wu Shi Ke, a Hainanese immigrant who moved to Singapore via Hong Kong… (saw the sock) for the first time in 1938“. Nanyang Coffee is also unique in adding of sugar and evaporated milk. Each coffee shop have their unique taste as they are all personally brewed by tau chiu (head barrister) by hand. The story of Kopitiam is intertwine with the local Hainanese community. According to ‘Singapore Kopi Culture‘, Hainanese people are the last few dialet group to arrive in Singapore, they are the minority known as Xin Ke (新客). The jobs that were available to them were less desirable, working as farmers, seamen, rubber-trappers, wait staff, cooks or domestic helpers. But because of that, they have become very experienced cook, able to prepare Western and Peranakan dishes. The Hainanese then recreate the western breakfast and created the Kaya, a mixture of coconut milk, sugar and egg to take the place of the more expansive western jams. 100 years later, in around 1920s there was an flux of celibate Cantonese single women who work as Majie and Samsui women (most Samsui women worked in industrial area similar to their male counterpart Coolie, but there are also some who work as domestic workers). Beside that, in 1930s the Great Depression happened and many Hainanese rubber-trappers lost their jobs. Due to this, the Hainanese people turned to working at what they do best – culinary. Many Japanese-owned hostels and enterprises located along Beach Road went out of business and the Hainanese people took over. This paved the way for other Hainanese people to do the same in other parts of southern and eastern Singapore. These early kopitiams “were strategically located in shophouses” and they become a perfect place for new residents to socialise and unwind. The book mention that “it is difficult to trace the origins of the coffee shops to the exact era”. Mass migration of Hainanese people from Qiong Zhou arrived and congregated in the Beach Road area, also referred to as Hainan Company area. “It covered Tan Quee Lan Street; Liang Seah Street; Middle Road… Hylam Street; Purvis Street; Second Street… and Third Street“. The earliest kopitiam that I have sources to back me up was Kheng Heo Heng Coffee Shop, founded in 1919, now known as Killiney Kopitiam and originally located at 67 Killiney Road. Another kopitiam is known as Ya Kun Kaya Toast located at Telok Ayer Basin that started in around 1936 but was only formally registered as such in 1944. Some interesting information from the book mention that “when gambling dens became illegal in 1829, some kopitiams serve as meeting points for gangster and secret society members. There were false walls hiding the entrance to a back room”. There were also only a few kopitiam allowed to operate late into the night int he past, and during that time some coffee shops near the “former Tongji Hospital and Bugis hired ‘Kopi Girls‘” similar to today’s beer girls. Kopitiam that hired them uses rectangular tables instead of round ones. This trend of using Kopi Girls decline by 1950s. Another interesting information from the book was that the kopi cup was based on the French Demitasse which originated from French in 1800s. Also the fact that coffee will turn sour when reboiled so in the early days they heat the ceramic cups over charcoal flame instead. The prints on the cups are actually advertisement of the coffee processing company that supply the coffee shop.